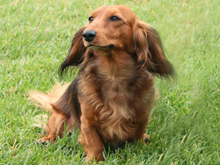 Welcome to DoxiFun, home of the "Dachshunds of Costello" -- longhaired dachshunds having lots of fun in dog sports including earthdog, agility, obedience, field trials, rally obedience, tracking, freestyle dance, and everything else that dachshunds love doing! Bossa (FC MACH2 Chirribi's Bossa Nova Baby BN RI NF JE CA) was born on March 4, 2012 on the island of Gotland, Sweden and joined us in California in June 2012. Bossa has already earned her field championship and Junior Earthdog titles and earned her Master Agility Championship in January 2017. Bossa is smart, athletic and attentive, and has years of training and fun ahead of her. Follow Bossa's agility career on this page. Bossa had five puppies on 18 August 2018! Olive (FC MACH PACH Autumn Olive von Dorndorf VCD1 TD CD RAE MXS MJB MXPB PAX NF JE) is Asti's litter sister and was born on June 10, 2004. Olive joined us in January 2010 and earned seven new titles in her first year. Olive earned her MACH agility title on 11 August 2012 and earned her PACH on 2 August 2014. 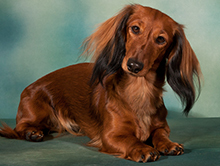 She earned her Junior Earthdog title on 25 June 2012 and has now titled in six AKC performance venues. Olive is smart, enthusiastic, and very affectionate. Asti (FC Arlina Ossie von Dorndorf RE AXJ NF CA) was born on June 10, 2004 and joined us in July 2005. 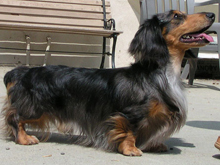 Asti is dual registered with the American Kennel Club (AKC) and Deutscher Teckelklub (DTK). Asti is smart, agile, and a wonderful companion. Her enthusiasm for hunting helped her earn her Field Championship and Coursing Ability titles. But Asti is often scared of strange dogs and new situations and had to really work for her agility and rally titles. Remy (FC PACH Wagsmore's My Favorite Martin CD RAE4 MX MXB MXJ MXPS MJPG PAX2 XFP ME W-BBFD-MF) was born on October 27, 1997 and died on December 21, 2010. Remy was a great canine athlete and our loyal partner and friend. Everything we do in dog sports is Remy's legacy. Ouzo (DC Spectrum Wagsmore Silver Screen BN RE NAJ NAP MJP NFP EE) was born on September 20, 2000, and died on May 18, 2018. Ouzo joined our household as a 3 year old show champion in June 2003. 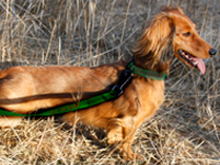 He turned out to be a very talented field dog, excelling in both earthdog and dachshund field trials. Ouzo lived with Diane's sister Margaret for many years, continuing to enjoy agility, obedience, and earthdog. 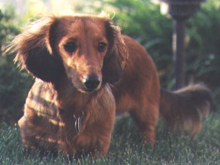 Brandy (Wagsmore's Brandy Alexandra CD RE OAP NJP ME) was born on November 10, 1996 and died on October 25, 2014. 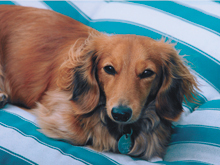 Brandy was our first dachshund, everyone's favorite girl but not the most gifted canine athlete. Brandy lived her last years happily being an "only dog" again with Bertha Adamson in Denver.